Only three major arguments are available for use by the most strident (private and governmental) anti-TONA critics. What exactly are these arguments? 1. Virginia never answered President Monroe/Secretary of State John Quincy Adams' inquiry about the TONA's ratification status. 2. Virginia's General Assembly members were unacquainted with the contents of the Revised Codes which the Revisal Committee produced, and voted in ignorance on that final product. 3. With Illinois, Indiana, Louisiana and Mississippi achieving statehood before March 12, 1819, a total of 16 affirmative state votes became the lowest number needed. 1. The Constitution itself is silent about notification to federal officials by the states. Each state was free to implement ratification and notification in accordance to its particular legislative customs. Strictly construed, there is absolutely no requirement, in the ratification of amendment process of the Constitution, to notify the Secretary of State. 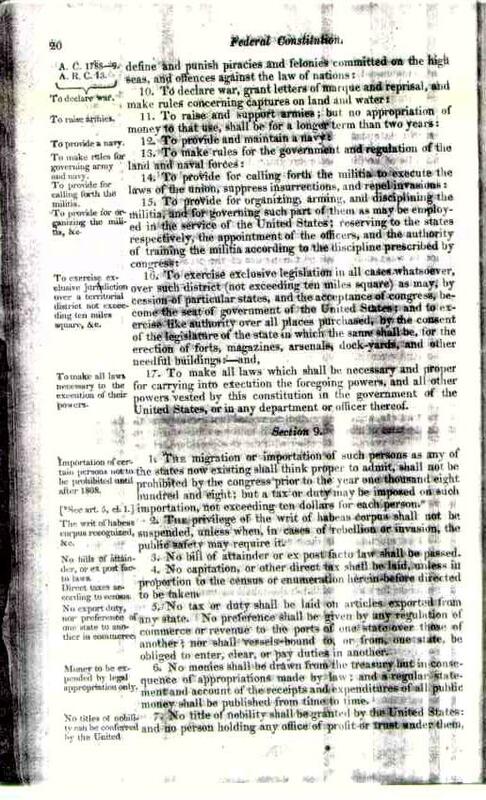 In 1818, Congress enacted a statute that required the Secretary of State to announce amendments. Virginia was under no obligation to do anything other than she did --- publish the amendment as ratified. We see on the Ratifications and Notifications page of this treatise that each did so in a different way. 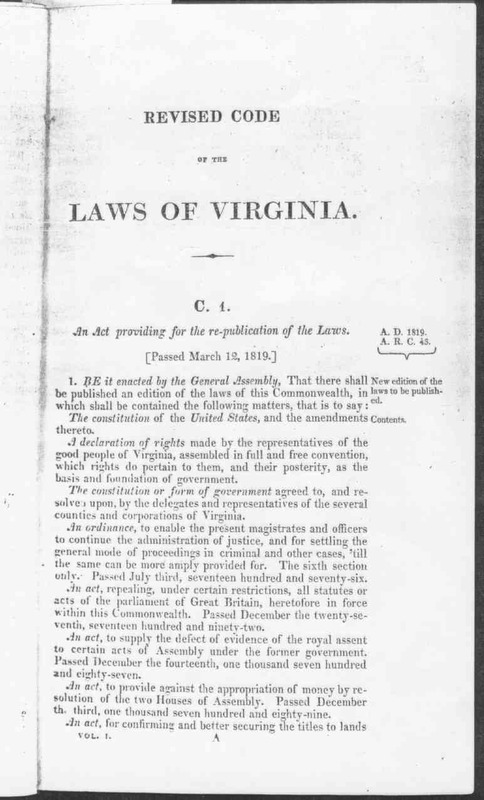 Virginia, being engaged in a complete revisal and codification of its laws at the time of the inquiry, elected to delay responding until completion of the revisal and printing. 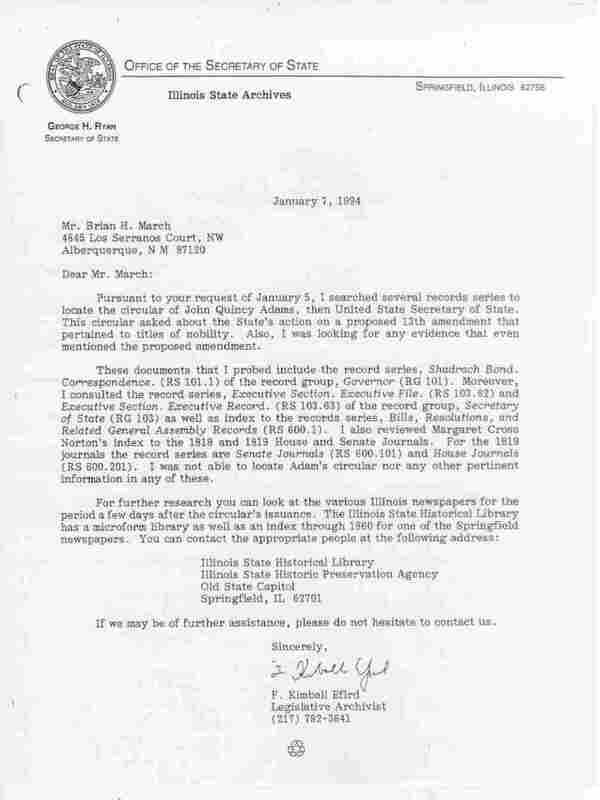 Upon completion of that effort, the Legislature ordered that copies be sent to the Secretary of State, Congress, the Library of Congress, the President and all living past Presidents. 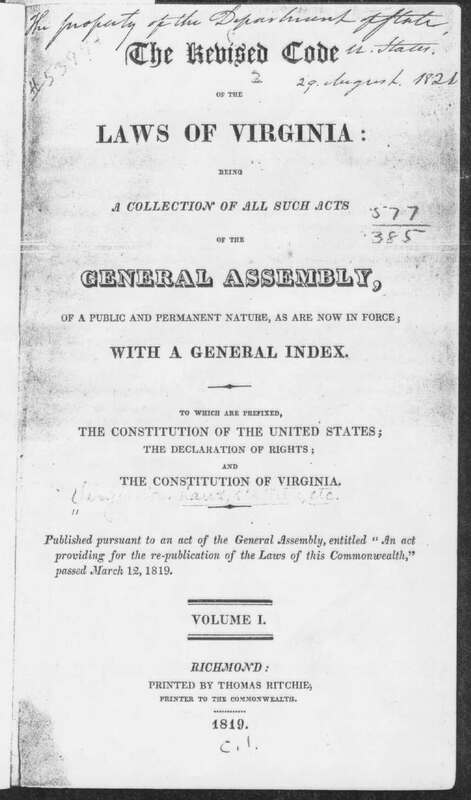 The State Department under Secretary of State John Quincy Adams from 1817 to 1825, during President James Monroe's administration, received four copies not later than 29 August 1821, as can be seen in the title page image of the second copy of the Revised Code of the Laws of Virginia and also in the 1820 Chapter XVIII Act of the Virginia General Assembly, passed February 24, 1820, designating the recipients of copies of this Revised Code book. These enactments by Virginia completed the ratification process. 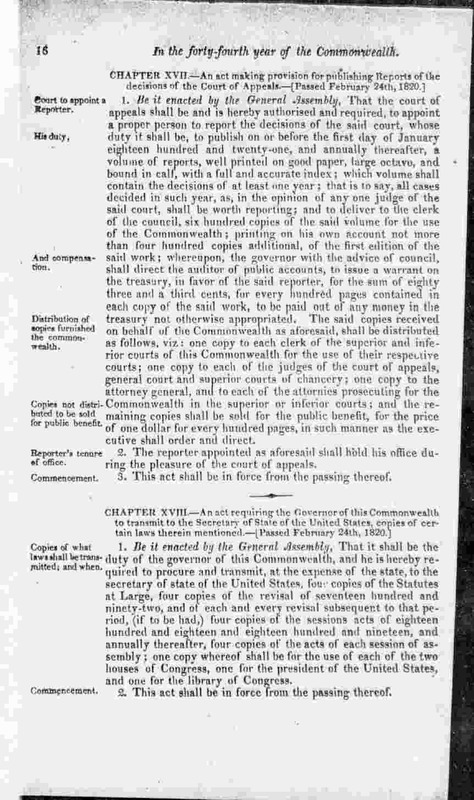 Notice the marking at the bottom of the image "C.1" drawing attention to the Amendments to the Constitution, including the 13th Titles of Nobility and Honours amendment. See Page 30 of the Revised Code showing Articles 12 and 13. 2. The assertion that Virginia's General Assembly members were unacquainted with the contents of the Revised Codes is refuted by the Revisal Committee reports to the Legislature. 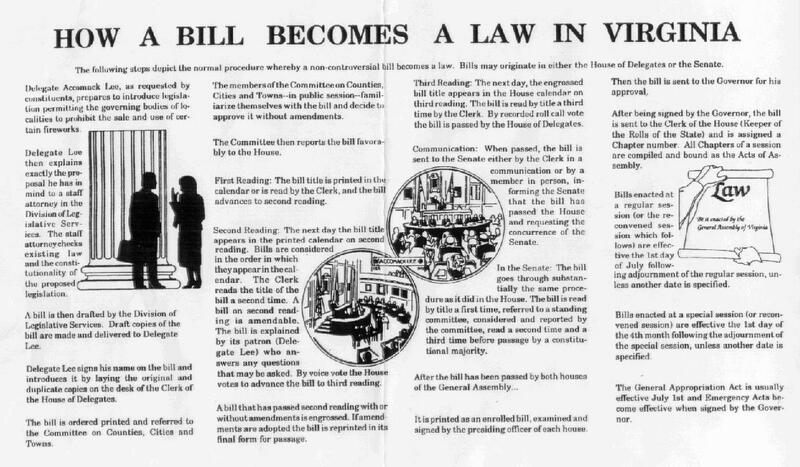 The Committee was diligent about keeping the members of the legislature informed of its progress revising and reorganizing Virginia's codes, providing the House of Delegates and the Senate each with a copy of the work in progress. 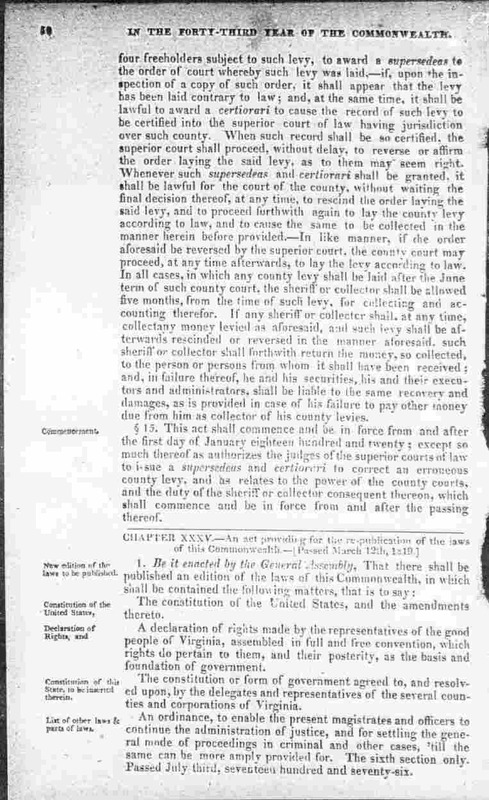 The Act of March 12, 1819 was the culmination of this effort. This is well presented in both the Legistrative History and Legislative Extracts sections of this treatise. Additionally, the presence of cross-referenced side notes on pages 20, 21 and 30 of the Revised Codes book clearly and unequivocally demonstrate attention to the presence of the Titles of Nobility Article as the latest amendment to the constitution of the United States. 3. Factual evidence of non-participation by the above mentioned four states concerning ratification of the TONA augur a strong precedent. All parties to the process did not consider these states as entitled to participate. 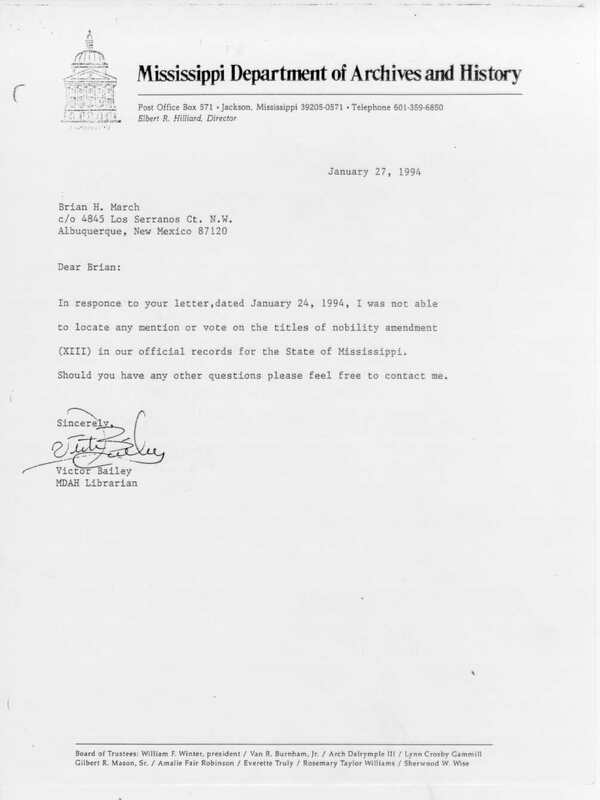 We know that the states themselves did not issue any request(s) to register their opinion(s). President Monroe and Secretary of State John Quincy Adams clearly did not view them as entitled to be included and Congress did not contact either their governors or legislatures for their opinions and votes on the TONA. Later historical evidence makes this argument rather weak as well. In January, 1994 the TONA Research Committee queried these four states. 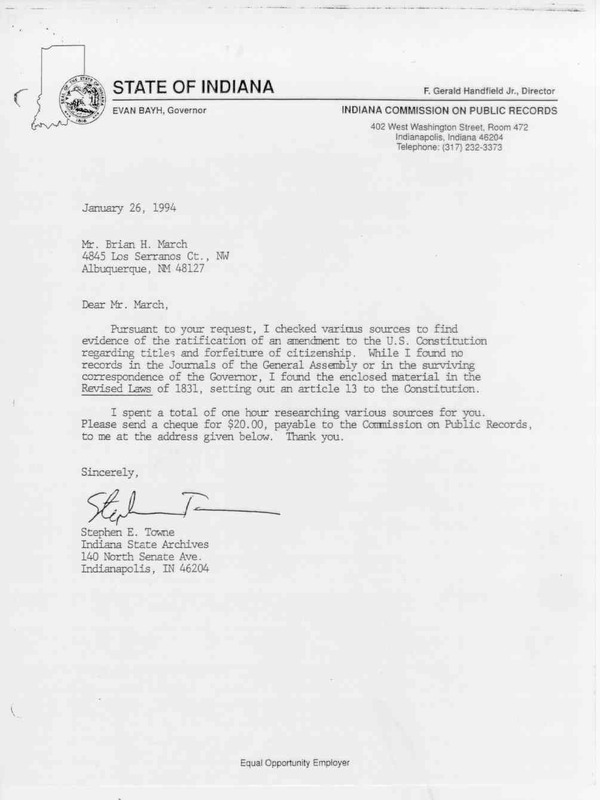 Each state, Louisiana, Illinois, Indiana and Mississippi returned certification reporting an absence of communication between their state and the Department of State regarding the TONA (XIII). 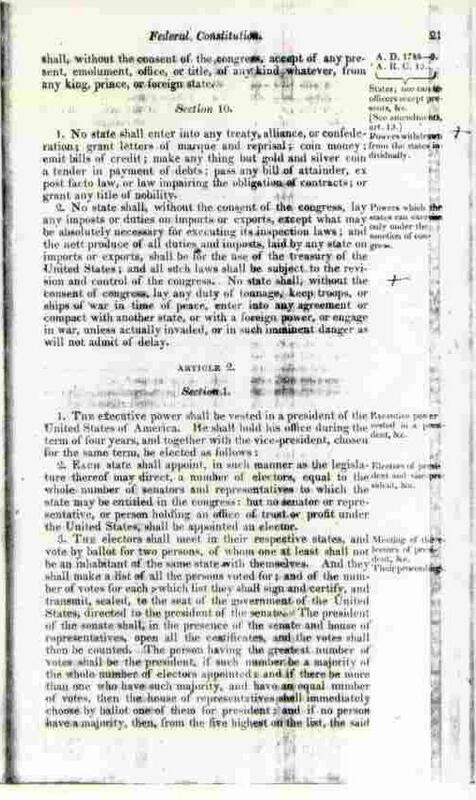 "The proposed 13th amendment was submitted to the States by the 11th Congress at its 2d session (May 1, 1810), and it was not until 1818 that it was ascertained that it had not been ratified. There were then 17 States, and the affirmative action of 13 were required. Twelve ratified promptly, four rejected, and Virginia was never heard from. In South Carolina the senate approved, and if the house had concurred the amendment would have been ratified. It was in fact for many years the popular belief that it had been ratified." We note, however, that this statement contains an error. Only 3 states rejected: New York, Connecticut, and Rhode Island. South Carolina's House of Representatives tabled the resolution and, apparently, took no further action. 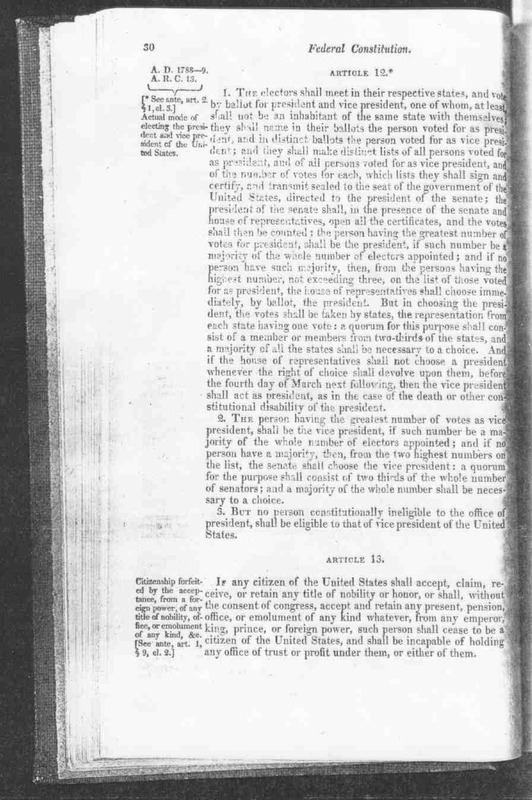 Thus, Virginia's enactment, publication and subsequent transmission of the Revised Codes of the Laws of Virginia to the Secretary of State, both houses of Congress, the Library of Congress, and President Monroe more than fulfilled the 13th lawful affirmative action required for ratification. 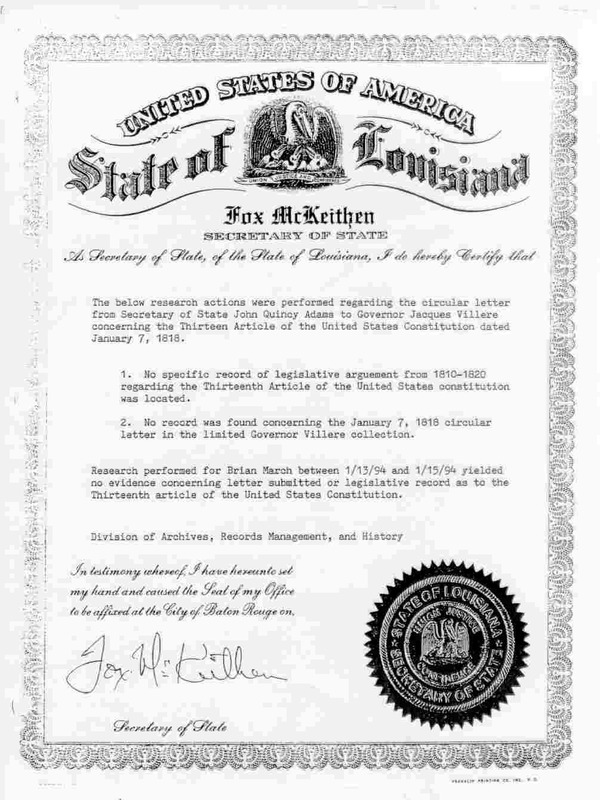 This official statement that the TONA would have been ratified had South Carolina's House rendered an affirmative vote refutes the claim by some that, since the new states of Illinois, Indiana, Louisiana and Mississippi had been admitted to the Union, 16 votes rather than 13 were required. We have thus dispelled each of the arguments adverse to recognition of the original 13th Article of Amendment to the Constitution for the United States.